Is me. Remember I got your Love Charm thai amulet from u. It has been 3 weeks. I felt nothing happened. Then yesterday, something weird happened in late evening at 11.30pm. Before that, in the morning I make my usual wish to Love Charm & follow your instructions. What happened next is out of mind. My phone was flooded with all my ex girls who ignore me long ago. There was one 1.5yrs ago gal. They text me & asked me where am I & what I am doing. I was like..... "Wow"... I have to pause & recall each girl b4 I replied them. Since I got the amulet, I have been praying for things I wish to happened. Finally it pays off. Thank u Nanyan. 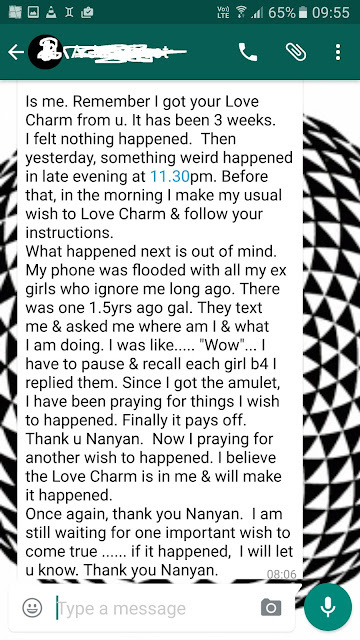 Now I praying for another wish to happened. 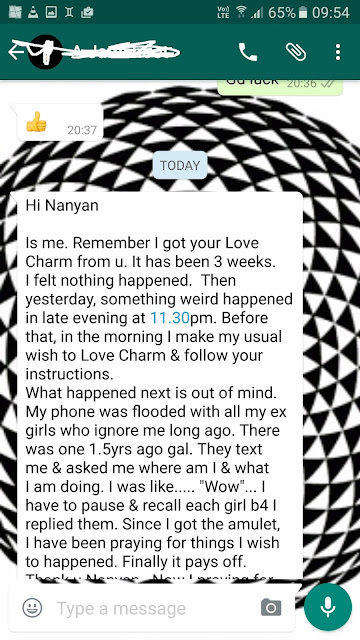 I believe the Love Charm is in me & will make it happened. Once again, thank you Nanyan. I am still waiting for one important wish to come true ...... if it happened, I will let u know. Thank you Nanyan.